based aperture array tests at the MRO. 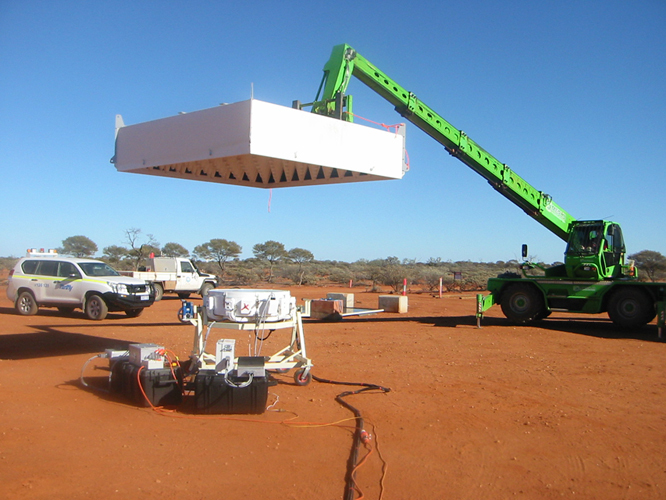 The first results from ground-based system tests on the full-size second generation (Mk II) phased array feed receiver have indicated impressive system temperature across the ASKAP band. The preliminary ‘ground-based’ aperture array tests were performed with the new Mk II prototype PAF receiver, and associated digital receivers and beamformers, on site at the Murchison Radio-astronomy Observatory (MRO) in Western Australia. The team made ‘hot’ observations with an absorber positioned above the PAF, as well as ‘cold’ observations of the sky, taking measurements of the beamformed system temperature (Tsys) using similar methods to those used to characterise the proof-of-concept, 40-element Mk II PAF at the CSIRO Parkes Observatory. 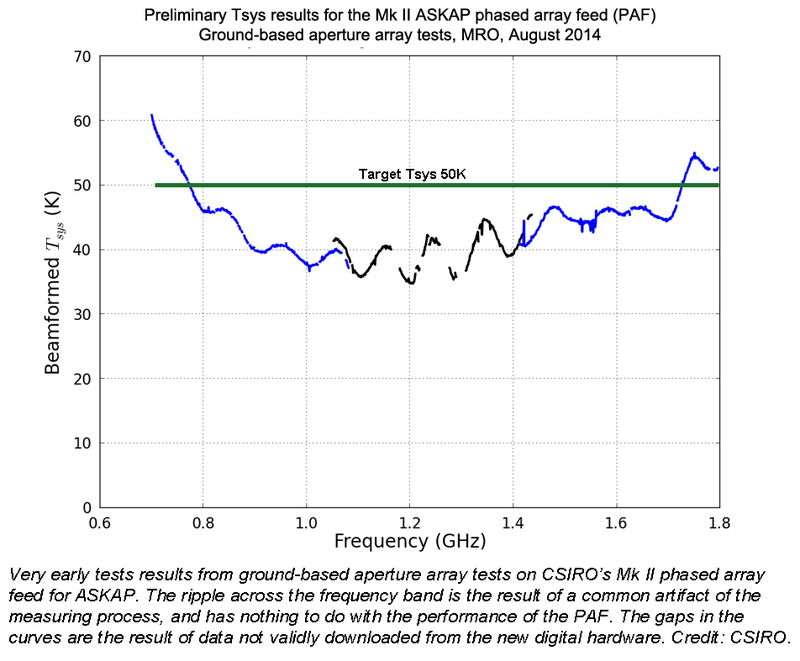 The initial results from the MRO tests are split into three segments, corresponding to three analog ‘sub-bands’ used to cover the full ASKAP frequency range (700MHz – 1.8GHz). The ripple across the frequency band is the result of a common artifact of the measuring process and has nothing to do with the performance of the PAF. The gaps in the plot are the result of the removal of unphysical data in this initial measurement. These preliminary results are very encouraging and indicate that the Mk II PAF performs much better than the first generation PAFs already deployed on the first six ASKAP antennas at the MRO, which are currently being used for commissioning activities(*). The ground-based tests are invaluable to help the team understand how the Mk II PAF functions in the radio-quiet environment of the MRO. 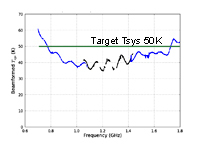 Further data analysis is required to fully characterise the performance of the MK II PAF system, but the measured system temperature suggests that when mounted on an antenna in the coming weeks, the team can be confident that the Mk II PAF will meet the 50K Tsys target right across the ASKAP frequency band. The Mk II PAF was designed, developed, and constructed as part of the ASKAP Design Enhancements (ADE) program led by Dr Grant Hampson. 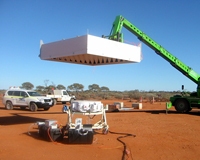 Focused on design enhancement through new technologies and assembly techniques, the new receiver design offers significant benefits in system performance across the ASKAP band. *Known as the Boolardy Engineering Test Array, or BETA, the six-antenna test system at the MRO installed with Mk I PAFs is already producing exciting early science and demonstrating the flexible widefield capability of PAFs. CSIRO scientists are now beginning to prepare the first papers for publication using BETA commissioning data. Back to Latest ASKAP News page.